So many of our guests love photography and for years have been asking for a dedicated photography itinerary that focuses on providing the mentorship of a professional photographer in conjunction with being allowed the time to capture special moments along the Great Ocean Walk. 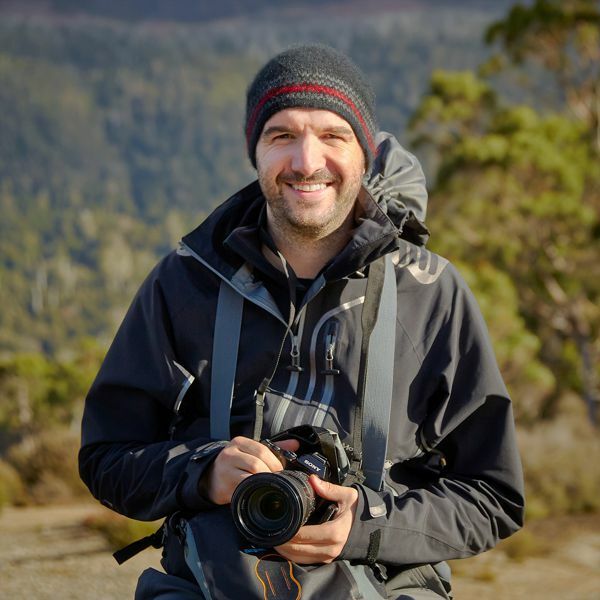 We're delighted to announce that Twelve Apostles Lodge Walk has partnered with multiple award-winning astro, nature and landscape photographer Luke Tscharke (who's also a very keen bushwalker!) to deliver a small group three-day photography trip departing Saturday 14 September 2019. This special itinerary has been designed for both photography enthusiasts and professional with a specific focus on creating the time during walks for photography opportunities. Luke will be joining each walk, along with two professional walking guides to provide creative and technical photography advice. 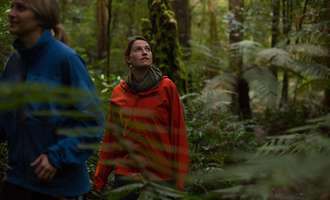 Following each day's walk, our group returns to our private forest eco-lodge to be treated with foot spas, evening canapes and delicious evening meals. For those with enough energy, Luke will be running evening photography workshops, providing tips and skills and sharing knowledge to enhance each day's photography walk. 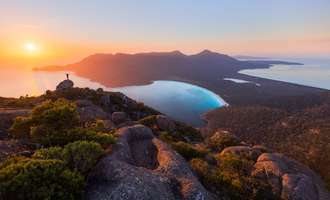 Hello, my name is Luke Tscharke and I’m an Australian landscape and nature photographer. I am passionate about inspiring people to travel and see the beauty in the world around them. I originally trained as a Quality Assurance professional with a Bachelor of Science degree and have worked for some of the world’s largest food and beverage companies to ensure the quality and integrity of their products. I like to think that this same meticulous approach has been instilled in my photography, where I strive to create iconic natural landscape images from locations across Australia and other parts of the world. The quality of my work has been recognised by awards in many photography competitions, publication in books, calendars, and magazines, and work with corporate clients, tourism organisations, and charities. 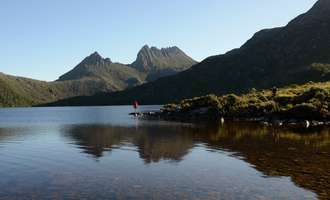 I am a regular contributor to Australian Geographic Magazine, where I’ve had two magazine covers, and my first feature story in the magazine was published in January 2018 on the remote Western Arthur Range in Tasmania. I also contribute images and articles to the Australian Photography magazine, and I’m an Accredited Professional Photographer with the Australian Institute of Professional Photography (AIPP). 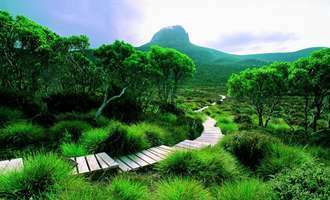 I have been fascinated by the natural environment ever since I was a child, and have been able to merge this interest with a love of bushwalking to be able to photograph some of Australia’s most stunning and wild natural environments. I love helping and teaching others through photography workshops and I am delighted to be partnering with Twelve Apostles Lodge Walk in September this year to showcase this incredible walk to photography enthusiasts and professionals. 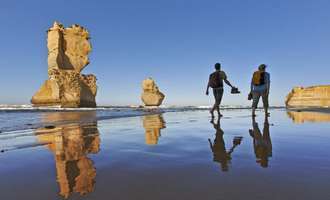 Our Twelve Apostles Lodge Walk shuttle will meet you at the Travelodge, Southbank, Melbourne at 7:45 am and travel by road for two hours to our stunning private lodge (please note we do not travel via the Great Ocean Road). Here you'll be welcomed to the lodge, by your two guides and lodge hosts. Following a walking briefing and morning tea, it's time to lace up and step out onto the trail (after a very short drive) to begin walking, with a tasty hiker lunch tucked in your pack. Today begins in the tea-trees with a few tantalising vistas out to the Southern Ocean. This will be your constant neighbour for the next four days. Enter a flawlessly-groomed grass tree forest and hear tales dating back 104 million years at Dinosaur Cove. Bring those boots to a halt and consider a time when dinosaurs occupied your very location. Next, drop down onto Johanna Beach. 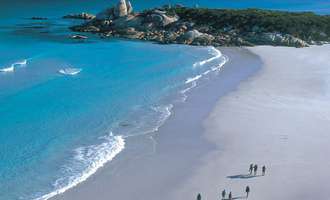 This is an opportunity to kick off the boots and walk barefoot; wind-swept waves just metres away. This two-kilometre stretch has a knack of clearing busy minds and washing away city stresses. Take your own pace across sands frequented by hooded plovers. At the end of the beach awaits your cool water and lemonade greeting, a constant across all four days. 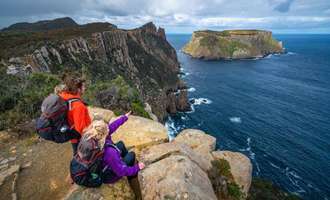 Our itinerary provides plenty of time throughout the walk to capture moments; however, we believe the best photography vantage point is at the conclusion of the trail with magnificent views back along the coastline. Today is about shipwrecks, sandy pathways, exposed heathland and maybe even first glimpse of the Apostles. What better place to commence the walk and get your bearings than The Gables Lookout, one of Australia’s highest cliff-top vistas. After the challenging undulations of yesterday, day three is pleasantly less furrowed. More than 300 ships have come to grief on this stretch of coastline. Your first stop is aptly named Wreck Beach. It’s a suitable reminder of those early days and treacherous ocean voyages. If conditions allow, you’ll drop down to Wreck Beach and hear tales of pillaging and misfortune including a ship which travelled from China whose cargo of tea coloured the ocean. 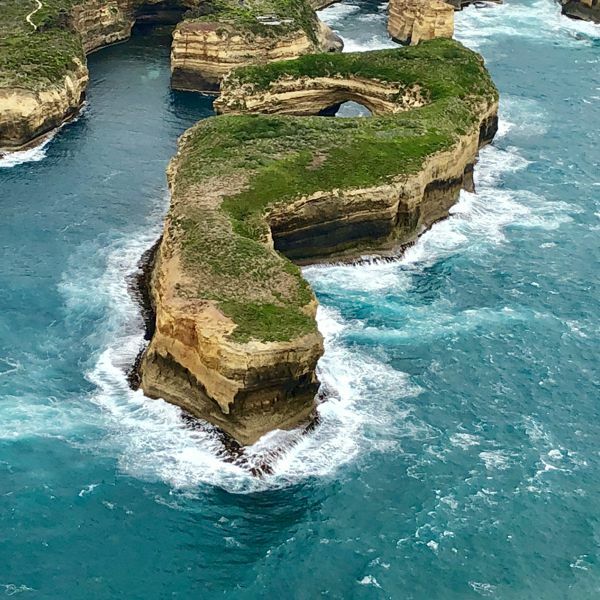 Depending on the tide, an alternate route leads through to Devils Kitchen, home to arguably Australia’s best lavatory vista! Following lunch, notice how the geology begins to change from sandstone to limestone. Thick Eucalypt forest gives way to sections of moonscape, indicators of what’s in store. Keep an eye out for native rosemary, cushion plants and wildflowers in season. Your first glimpse of the Gellibrand River marks the entrance to Port Campbell National Park. This freshwater river near the sleepy hamlet of Princetown is an easy downhill stroll. After some 12.5 kilometres, reward yourself with a cooling river dip. Today invites new heights. 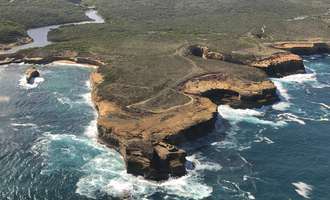 Not only will you conquer the final steps of your Great Ocean Walk but top this with a 15-minute helicopter flight. 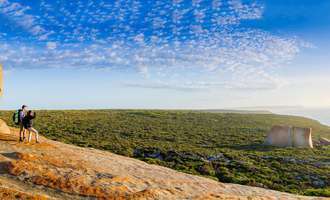 Depart from the quiet shores of Princetown by the Gellibrand River, beginning with an easy 30 minute wander to reveal your first full view of the Apostles. Gasps aside, keep an eye out for two resident mobs of kangaroos across the hillsides to your right. There’s a sense of elation today as you draw nearer to the mighty limestone Apostles. No, there’s not 12, which may come as no surprise. But amongst the proudly standing 7, lie 5 recently discovered apostles beneath the ocean’s surface. 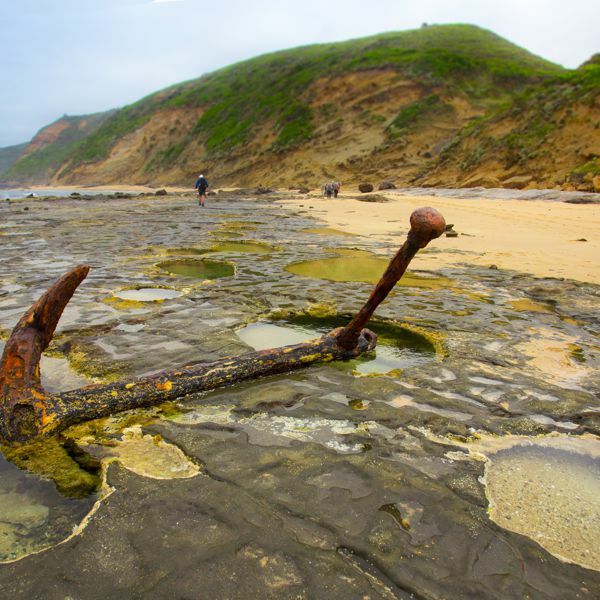 Weathered but not beaten, those in view lose a couple of centimetres each year to the perilous swells and winds whipping up from the Southern Ocean. Drawing closer, hear the romantic tale of Tom and Eva. Tom, a gallant local who swam more than an hour to rescue Eva from the Loch Ard, perhaps Victoria’s best-known shipwreck. Of 63 on board, Eva was one of the lucky two to survive, whisked to a cave by Tom and ‘administered’ brandy to remain conscious. The Apostles reveal gradually along this stretch, reappearing as the trail rises. There’s a viewing platform exclusive to walkers on the final stretch before your arrival at the Visitor Centre. It’s the official end to your walk and an appropriate locale to get cozy with the Apostles in a group snap. If conditions permit, don’t miss the opportunity to descend 80-plus steps to the beach below. This final perspective gives a sense of the Apostles brooding heights, one 73-metres tall, nudging the equivalent of a 20-storey building. It’s here with sand under your boots, a sense of monumental achievement and wonder sets in. Take to the skies to bid farewell with a 15-minute helicopter flight. Capturing the chiselled coastline from above gives scale not only to the Apostles but the trek you’ve completed. Follow this with a final lunch in the sleepy fishing town of Port Campbell before returning to Melbourne. At the end of a day out on track, the Twelve Apostles Lodge is a forest-hugged refuge three hours from Melbourne. This is where the foot spa awaits, rainforest showers, kitchen garden, dining room stocked with local wines, and your king bedroom with spacious en-suite. The architecturally-designed lodge has been crafted with environmental sensitivity in mind. This translates to passive solar design, hydronic heating, low consumption electric and water fittings, on-site wastewater treatment and composting, plus a self-sufficient water supply. And there’s a reason this eco-development is award-winning, delivering modern comforts with equal rigour. 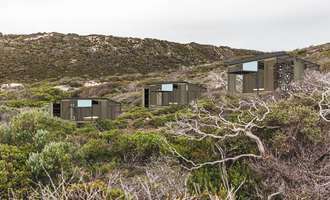 Expect Myrtle & Moss toiletries, hair dryers, library, mobile coverage (Telstra only). What’s more, the lodge is exclusively yours. The only way to stay is to join one of our walks. That means the moment you arrive, consider it home. Unpack your bags and get comfy. Five generous bedrooms can be converted to twin share or two single rooms depending on group requirements - all enjoying access to private en-suite bathrooms. Onsite you’ll also find 24-hour tea and coffee facilities, gear drying room, daily newspapers and a lodge library well stocked with magazines, reference and fictional books or ask about the lodge property walks. You’re not alone if you don’t stray far from the foot spa and dining table though! One complimentary clothes wash (including soap) is included in your walk package, the Lodge Manager will explain how this is organised at your briefing on day one. Additional loads are charged to your tab to discourage excessive usage/environmental impact.